Gargamel’s has casted an evil fog spell to capture all the Smurfs. The whole village is gone and you’re the only Smurf left! Run away from the fog, parkour a vivid world, gather powerful magic artefacts and save all your Smurfs friends to become the true epic hero of the village! • DISCOVER a gorgeous, magical and funny world directly inspired from the original Smurf comic-books. • PARKOUR multiple locations of the Smurfs world including the village, the forest, the mine and Gargarmel’s Castle! • PLAY with your favorite Smurfs including Smurfette, Papa Smurf, Handy Smurf, Brainy Smurf and more than a dozen other famous & funny characters! • FREE each Smurf and use their unique epic powers (Dash, double jump, stomp, magnet…) to rush through each level and set the best score. • RACE and compete against your runner friends & the world to establish the best score in the Weekly Tournament. Who will run the farthest in these weekly endless levels? • EARN great prizes everyday by collecting Golden Keys, completing Daily Missions, spinning the Wheel of Fortune or asking the Farmer Smurf for his Good Deals. • UNLOCK magic portals and travel to challenging and mysterious regions: The Bonus Zones! 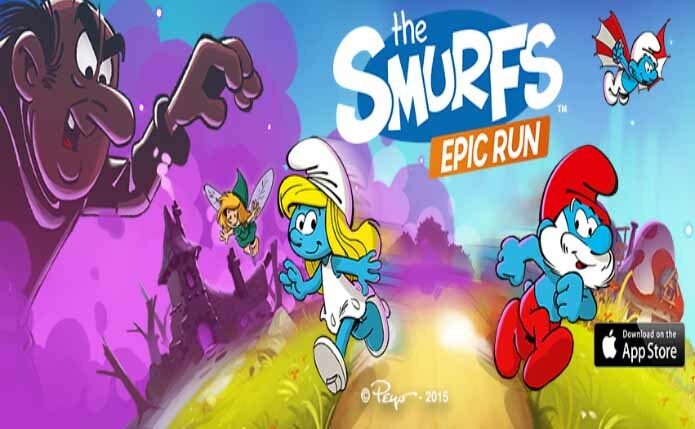 • GATHER your team of Smurf runners and enter the Epic Adventure: a daily challenge where the danger is everywhere. But so are the rewards! • This game contains advertisements. • Making any in-game purchase will disable interstitial ads forever.